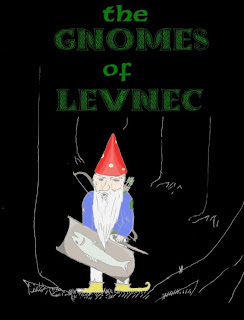 The Gnomes of Levnec is an adventure about the fate of an empire and the byzantine machinations of a court that no longer has a monarch. Just kidding, its about Gnomes. I really enjoyed this one. The Gnomes of Levnec is a short adventure, 16 pages, but you get a lot of value in those 16 pages. The book details a small adventuring area set around a remote village, Levnec. Within is described the village, a handful of characters, the nearby woods, and a few adventuring sites in said woods. The village has fallen on hard times, starvation is a problem, and the toymaker, a gnome, has been murdered. Worse, did some of the starving villagers actually eat the toymaker? There's an opportunity for a bit of investigative role playing. The author, Zzarchov Kowolski, incorporates a lot of humor into his writing style, and Gnomes is an entertaining read. There were a few times I caught myself laughing during the read through, and immediately knew I'd slot this adventure into any upcoming low level campaign. Between the investigation, the village, the woods, and the adventuring sites, there are quite a few interesting things to do, and the sense of dark humor and whimsy seals the deal and makes this a winner. There's also a nifty gnome recipe. Running this adventure will be entertaining for the referee. On the other hand, check out that cover. You might think a hand drawn gnome picture demonstrates some OSR hobbyist charm. If so, you'll be fine with the presentation of this adventure. If you require commercial game books to have high production values, take your $2.85 somewhere else. The maps and pictures are rough, and the writing could use some editing. None of that affects the game play, nor does it detract from the subversive humor throughout the adventure. Don't miss out on some fun because something isn't "professional enough". The Gnomes of Levnec is available at the usual suspects (RPGnow: The Gnomes of Levnec). It's for low level adventurers and will work well for any referee setting up a sandbox area who has space for an outlying village. It's system neutral and can be used with any old school version of D&D or clone game with no fuss. I'm recommending it. Believe it or not, Zzarchov originally wrote the adventure for a "cover band" version of my Dark Country setting, which he has been a regular player in on G+. I do believe it - there's an "old country" vibe in the names and situations that would play well in 'the land across the woods'. If that's how you treat gnomes in your campaign... wow. I'll never look at the lawn ornaments the same way. Despite my best attempts at persuasion, Evan has declined to allow such Gnomes into the night haunted halls of Nightwick Abbey. If you enjoyed this one but were put off at all by the "Made in Canada" production values, you might enjoy "A Thousand Dead Babies" which I went the extra mile to get professional art and layout with. I picked that one up at the same time and enjoyed it as well - I'll probably get a review done sometime in the next few weeks. Reviewing Gnomes was important. The World Needs To Know! I picked it up based on your recommendation. I thoroughly enjoyed it! I could not figure out how the maps of the temple were supposed to go together though. I had the map updated by Jez Gordon, let me know if it is more legible now (as I personally was not much of a cartographer I am afraid). For the three bucks you mentioned, I figured I'd grab it. Since it's twice that, though, I'm hesitant. I can get two other three buck things instead. Bummer. Zz must have raised the price. I checked it out when I saw your note, looks like a new cover, new art, probably a new layout from the version published earlier in the year. Sorry if there were any feelings of bait and switch. With new adventures I tend to put them out in a rough state for a low amount. I use those funds to then upgrade the adventure with professional art and layout as a reward to the early fans. This review merely happened to occur in the last few weeks before the updated copy was put out.